Combining her skills in running, motivation, and coaching with her desire to help girls form strong, confident opinions of themselves, Ashley founded Sole Girls. we are facing the same pressures about our bodies that have extended from childhood. As an avid runner, Ashley has run marathons, half marathons, and triathlons around the world. 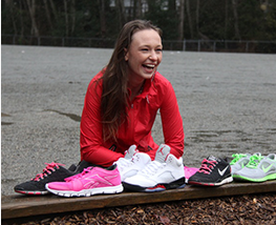 She started running when she was 6 years old as her school had a kilometer club program. Growing up with mentors who were also runners, she sees the benefits of sharing the incredible sport that allowed her to develop running as a tool used in so many ways! When she started coaching learn-to-runs, she noticed an incredible difference in the attitude of the participants towards themselves and their bodies! Having led empowerment retreats for Women in the past, Ashley was guided to combine her skills in running, motivation, and coaching with her desire to help girls to embrace their amazing selves and gain confidence in their appearance and thoughts! "GIRLS SHOULD EMPOWER EACH OTHER TO BE STRONG and AMAZING INSTEAD OF THINKING WHAT THE OTHER PERSON IS DOING WRONG."